The Pastoral Letters: A Handbook on the Greek Text offers teachers and students a comprehensive guide to the grammar and vocabulary of the Pastoral Letters. A perfect supplement to any commentary, this volume’s lexical, analytical, and syntactical analysis is a helpful tool in navigating New Testament literature. Larry J. Perkins leads students toward both a greater understanding of the Greek text and an appreciation for the textual and rhetorical intricacies not available in English translations. What distinguishes the Baylor Handbooks on the Greek New Testament from other available resources is the detailed and comprehensive attention paid to the Greek text of the New Testament. 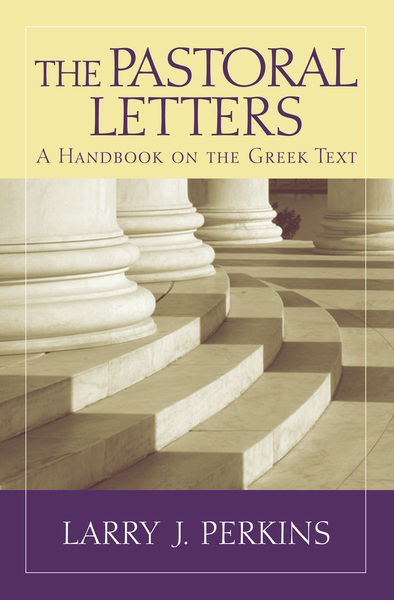 Each handbook provides a convenient reference tool that explains the syntax of the biblical text, offers guidance for deciding between competing semantic analyses, deals with text-critical questions that have a significant bearing on how the text is understood, and addresses questions relating to the Greek text that are frequently overlooked or ignored by standard commentaries, all in a succinct and accessible manner. Larry J. Perkins is Professor Emeritus of Biblical Studies at Northwest Baptist Seminary and the Associated Canadian Theological Schools of Trinity Western University. He is President Emeritus of Northwest Baptist Seminary.